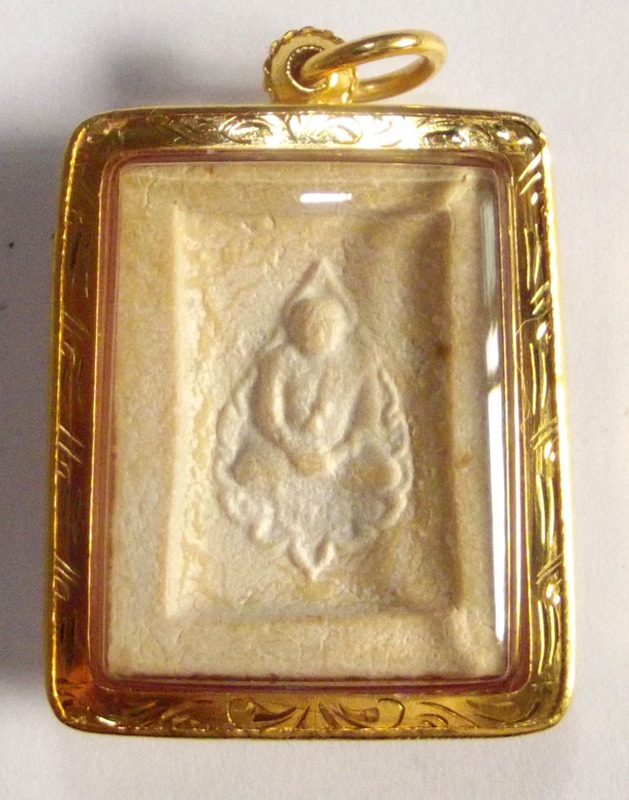 First Edition Pra Kam Khaw Amulet from Arya Sangha Guru Master, Luang Por Pra Racha Prohmayan (Luang Por Ruesi Ling Dam), of Wat Ta Sung. 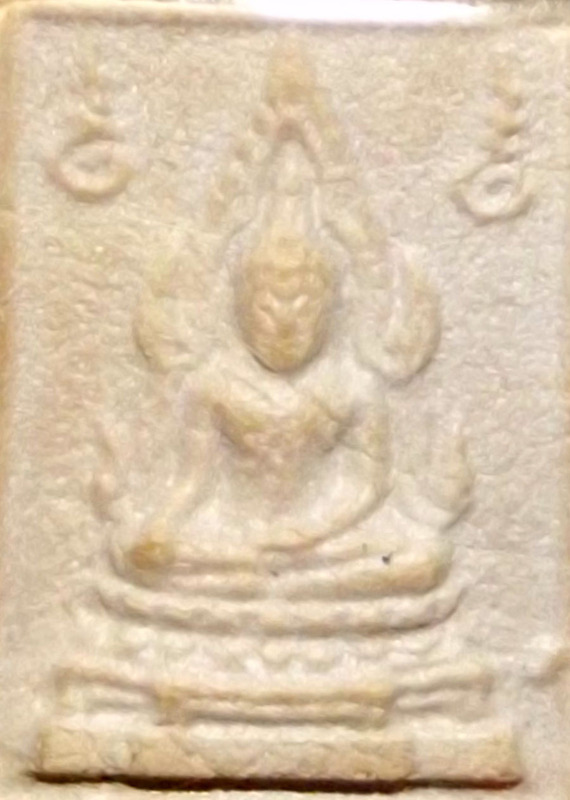 The first edition of Pra Kam Khaw amulets ever made by Luang Por Ruesi Ling Dam was issued in 2533 BE, and consisted of 10,000 amulets in the first edition. The amulets are known for their highly charged Puttakun Power, with all powers of Metta, Klaew Klaad, Kong Grapan, Maha Sanaeh, but are mostly famous because of their strongest Power, that of the Power of Lap Sakkara (Honorable Status, Promotion and Wealth). The Pong Puttakun (Sacred Powder) is visibly risen to the Surface and recognizably Authentic. 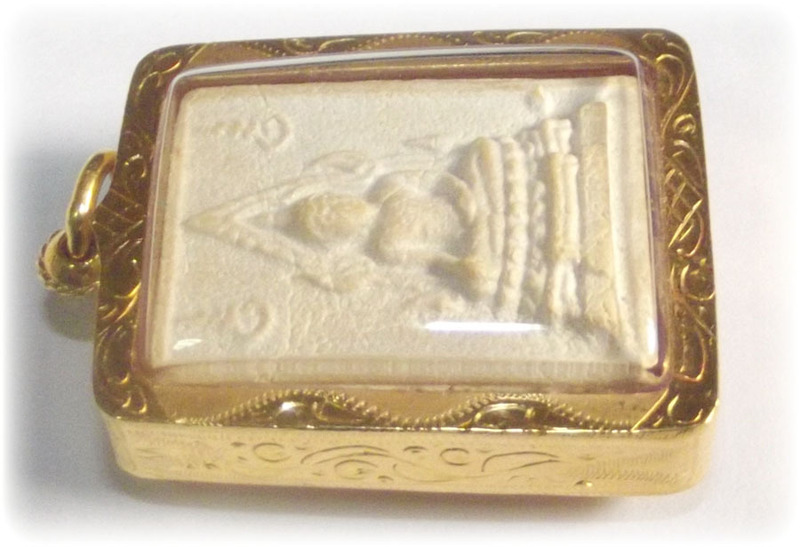 Solid Gold Waterproof Casing is included in the price of the amulet. Luang Por Ruesi Ling Dam even was known to have commented about the Pra Kham Khaw Maha Lap Amulets, and said; As Luang Por Parn was still alive, i saw him make a Buddha Statue from powdered dried rice from his Alms Bowl, which Luang Por Parn explained, that the Buddha had told him, that whichever food tasted delicious, he should not keep it for eating. The 2533 Edition is known as the 'Run Sorng' (second edition). He said it was important that one should take the first handful and use it for Muan Sarn to make powder amulets. That he should keep the first handful of the most delicious meals, and Empower them with Incantations. Luang Por tried it out for 4 months constantly keeping and empowering the dried rice wherever he travelled. Even if he would come to Wat ta Sung, he would have to keep the first handful of the meals and store the Muaan sarn, because the Wicha only works if the rice is kept for a period of 3 months of daily collection. If a single day is left out, the Wicha does not work. When the period of 3-4 Months was finished, Luang Por Parn then used the Muan Sarn to grind into sacred Powders and built a Buddha Statue for the shrine room where the Monks would pray together. A wealthy Devotee of the area then heard of the event (he was a motor boat factory owner), and brought some giant pots of curry and rice to donate to the temple. But Luang Por Parn had left on a Wandering Tudong Quest to the Mountain of Khao Wong Prajantr. Luang Por Ruesi Ling Dam retold that he was at Wat bang Nom Kho at thatb time, and that there was hardly any food at all in that period, and he had been going without food and very hungry. The boat owner parked on the banks of the river at the side of the temple, and asked where Luang Por was? Luang por Ruesi Ling Dam told him that Luang Por was away for a time. The Devotee then pulled away from the shore with boat and curry and all, and left. Oh dear! Luang Por said he was so hungry as he watched the devotee leave. It seemed that he only wanted to donate to Luang Por, for making Muan sarn, and did not want other monks to eat from it. So Luang Por Ruesi Ling Dam went hungry. For this amulet, Luang Por Ruesi Ling Dam laid out some information; Firstly, befoe we undertake any of our duties or tasks each day, we must think of the Buddha and his Acheivement, and to have deep respect in one's heart for the Buddha. 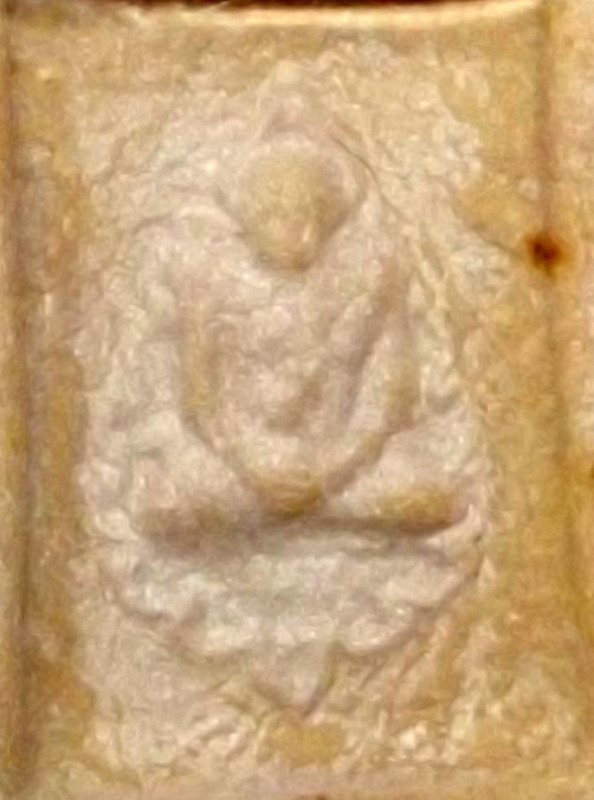 If one does this in the moment before Praying to the amulet, and focus to pray mantaining this Respect and Wonder at the Buddha's Self Enlightenment as you pray, then the amulet will emit Massive Lap Sakkara Power, to increase your Social and Professional Standing, and the Aura of Grandeur. 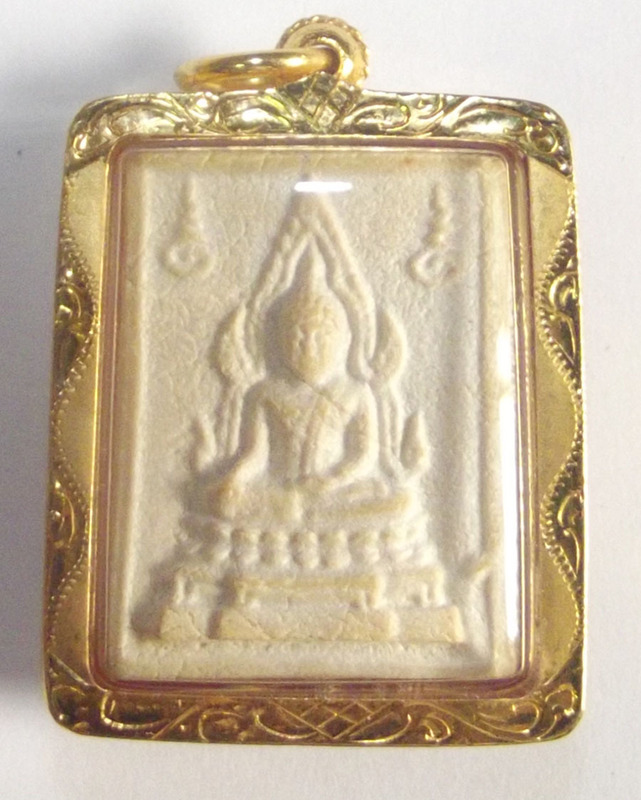 The amulet is said to possess all other Powers such as Klaew Klaad, Kong Grapan, Metta Mahaniyom and Maha Sanaeh, but is stated by Luang Por to have heavy leanings towards increasing Lucky and Wealthy Fortunes (Lap) and to Improve your Influence and Status (Sakkara). Then one should place the amulet between the palms of the hand, and raise between the eyebrows to the forehead, and Chant the Maha Namasakara 3 Times, after which, one shold say "Today, i ask for ..... (whatever it is you wish for).. Blessings". If we are able to focus on and believe strongly in the Buddha's Enlightenment and Call Upon His Merits to assist, then this is considered to be Buddhanisssati Kammathana - a Kind of Meditative state likened to, or equal to that known as 'Jhana' (absorption). This is the state of mind that is necessary to activate and call up Miracle Powers, and is tantamount to Pure Faith, which is also a kind of Focused One Pointed Concentration, Absorption, or 'Jhana'. One should also of course think of Luang Por Ruesi Ling Dam when Praying. It is this element of the Practice of Faith reverence in Guru Worship that gives Classic Amulets from great masters the edge over many standard issue amulets, for it is the Faith that the Master instills in the heart of the devotee (the wearer of the amulet), that increases the Power of Absorption, for it is much easier to feel Faith and Confidence from an Amulet that was made by a Guru Master that we all know of and is Legendary, and whom we believe in his teachings. If we do this every day before undertaking our chores and duties, we wil have Great Success and Acheivements coming our way. Like the Pra Kam Khaw, it is also important to remember that it is the Luang Por Pra Putta Chinarat Buddha (Pitsanuloke), one of the Five Most Sacred Buddhas in Thailand. The Buddha Chinarat, Luang Por Ruesi Ling Dam says is important to know and feel when praying, that it represents the Buddha Kassapa. It is an Image to look at instead of that Buddha, whose body is no longer here, but represents the Buddha Himself, and the heart should connect with that, as its connection to the Stream of Energy that flows from Nibbana and the Buddhas, down to us Devotees on Earth. The Buddhanussati remembrance and consequent Rapture that arises, is a direct cause of the energy flow that comes through the amulet from the Spiritual Realms of the Heart, coming from the Buddhas, to us. 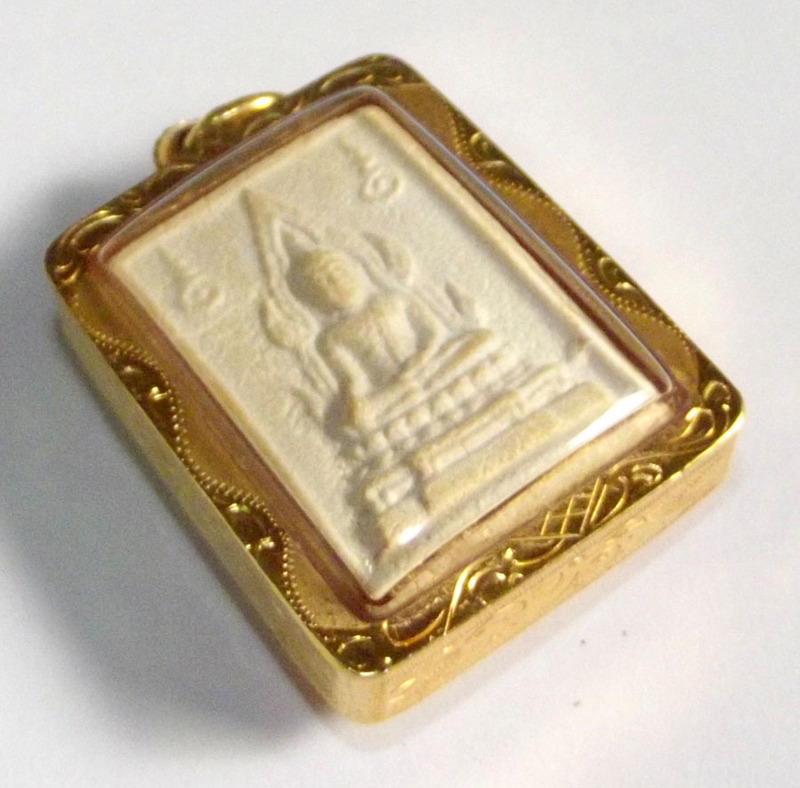 The Buddhas of the Ages will descend and Guard over You who pray correctly to this amulet. Use the Kata Ngern Larn (Millionare Kata for Riches), as given by Luang Por Parn, and Luang Por Ruesi Ling Dam, to empower the amulet with Maha Lap Magic and call great wealthy Fortunes to you.